How was everyone's weekend? Good I hope. I'm so happy to share this board with you today because it was really fun to put together. 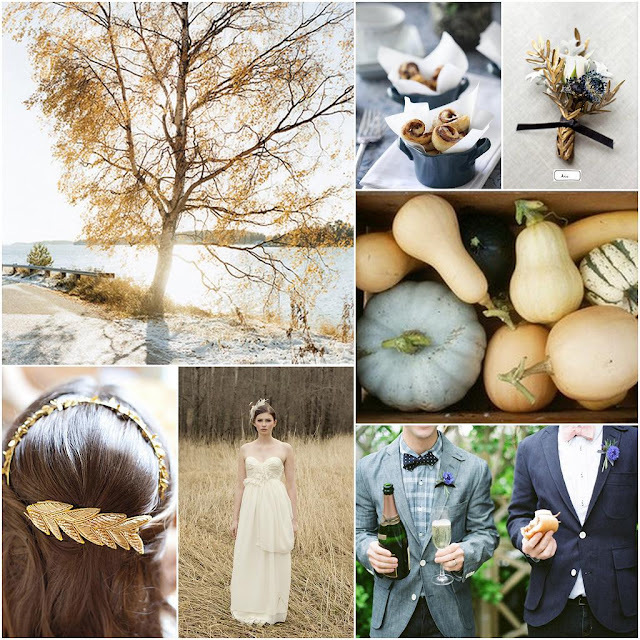 For the past few weeks I've been itching to feature autumn boards. Isn't this such a pretty palette? The rich blue paired with the light tan has to be my favorite color combination. I love the casualness of denim clad grooms and golden touches, don't you? Oh and I'm on the hunt for blue pumpkins this year! Now that autumn is on it's way, I can't get enough of boards like this. Beautiful... love the colours! That tree is stunning! Oh my WORD. This is why I adore your boards - they're so original and immediately make me fall in love with a new colour scheme or idea. I'd never have considered these for autumn, but they're amazing! LOVE. I love... makes me want to jump in leaf piles, of course I love summer. But, seeing the autumn colours is lovely! oh i love this! And not because I'm hosting a dinner on a farm this weekend that just so happens to have blue and tan in the color scheme;) There is something very calming and very cozy about those colors. Did you know you can bake with the blue pumpkins? They're called Blue Hubbard Squash and taste just like normal squash but are a great way to dress up your steps or table for the season! i love that gold headband! thanks for brign it to our attention. love the board. I love this board too much! Those little cinammon rolls are adorable! Great way to kick off the start of fall! oh i love this color palette! hadn't seen this one before! Denim is so in right now and I love the look for a casual wedding. What a magnificent board! I've been dreaming about serving soup in little pumpkins at Thanksgiving and now I think I know what kind of tureen to use-blue pumpkin! A beautiful board for a cool evening. The headband is stunning! oooooh the perfect little intro to fall! this is so beautiful. i don't know how you always hit the nail on the head. not a combination that i would have thought of, but lovely!